Another, sometimes, important item for a hero, is the mask. This is the face you will show the world and should be something that represents your name or personality. Mask wearing is also an important part of many cultures. 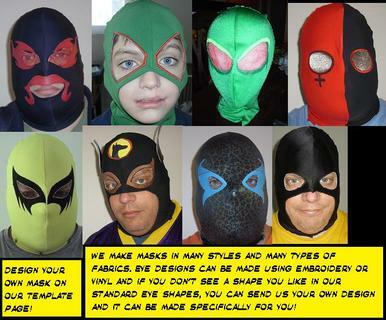 Our masks are made, like the BattleSuits, from Miliskin 4 way stretch spandex. Its lightweight and cool, hugs your face, but does not restrict movement or breathing. We do a number of different types of masks. Full face, open lower face, open top of head. or any combination you can think of. Also we custom embroider eye shapes on the mask, you can find over 100 shapes that we currently use, and we can pretty much digitize any design for a shape that you draw up. The eyes can be covered with a mesh in the color of your choice, or left open so your eyes can be seen. Its up to you and there is no extra charge for the mesh! We will hopefully be adding latex masks in the near future, so keep tuned in for updates. As with BattleSuits, the masks can also be made using Metallic or Wetlook Spandex for an additional $10 per mask. Another service we offer is custom embroidered patches. 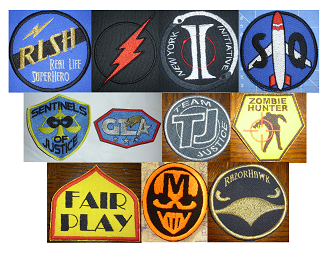 Our patches are high quality and can be based on most designs. 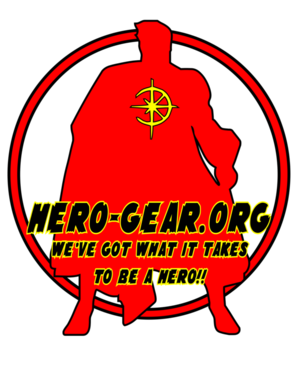 Lots of small lettering however may be difficult to get a good looking patch, so please e-mail your design to herogear@rocketmail.comto make sure that it is doable. Our patches can be made up to 4"X4" or smaller. Patches are simply $15 per patch, we do not charge a setup fee like other patch makers, so right off the bat you are saving $25!